Thank you, Gently Organized, for submitting your inspiring space to our flickr group. 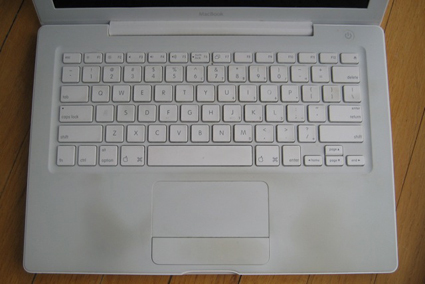 Immediately after Apple released its new MacBook and MacBook Pro laptop computers earlier this month, my e-mail account was inundated with questions about how to clean dirt and grime off white Apple laptops and keyboards. My assumption is that these readers want to upgrade to the new machines and sell their old laptops on eBay. Machines that look like new tend to grab higher prices on the bidding site. 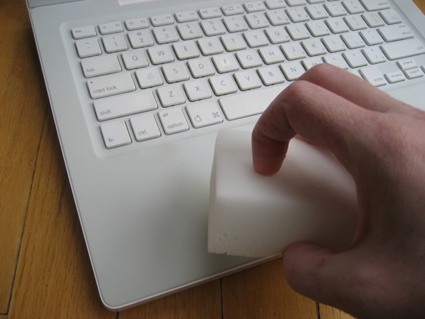 I own a white MacBook, so I decided to try my hand at cleaning my laptop in an effort to help our readers. 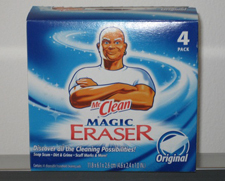 After making a few calls and asking for advice from my friends, I repeatedly heard that the Mr. Clean Magic Eraser was the cleaning tool for me to try. 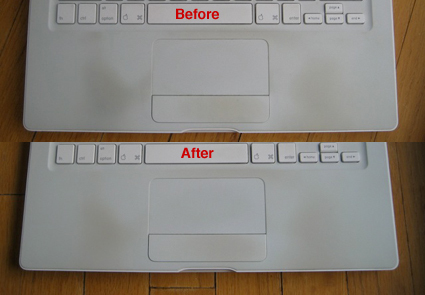 What have other people done to get dirt and grime off of white laptops and keyboards? I thought the Magic Eraser did an adequate job, but I’m hoping there is an even better product out there to help clean up the rest of the dirt. Let us know what you have found to clean laptops and keyboards in the comments. Fewer wires and increased communication with all of your devices sounds like a winning advancement to me. The technology for LED-based wifi has just begun, so I’m cheering for the labs at BU to work diligently to get this to market. This thirsty little towel reaches between toes for quick, thorough drying — keeping them comfy and healthy! Easier to use than a bulky bath towel, its unique shape fits comfortably between toes to gently whisk away wetness. Easy-grip handle prevents bending or straining. There you have it. No bending or straining (assuming you don’t dry your ankles). The marvels of modern technology never cease to make our daily lives easier! Reader question: How store earrings? Trays can be a great way to store earrings in drawers. It is easy to use and it is quite simply the best option for sharing photos of my daughter. On Monday, I had my wisdom teeth pulled, and spent most of the day propped up in bed catching up on some reading. 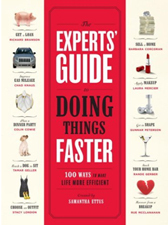 One of the books I read, The Experts’ Guide to Doing Things Faster created by Samantha Ettus, was a quick, fun, and informative read. The book is a series of 100 essays by professionals who are experts in their fields. Each essay focuses on how to be efficient at one aspect of living. The first 16 essays address issues in the home, and the next 11 essays provide tips for work. Mind, body, love, pleasure, travel, and future round out the other subject areas of the book. “Find a Lost Object” by Michael Solomon: “IT’S NOT LOST — YOU ARE. Accept that the problem is not with the object — it’s with you! For there are no lost objects — only unsystematic searchers.” (pg. 55). I recommend checking out the book if you’re interested in reading something fun on efficiency. I certainly enjoyed this book. The hack uses the Ikea Pax wardrobe and Trofast storage boxes, which fit perfectly in the slots. This hack stores an incredible about of toys and is simple to create. I’m not sure if my daughter has enough toys to fill a full Pax wardrobe, but I’m sure we will be able to find use for all of the drawers. Tips for how to store and dispose of old paint. Assembly line meal preparation stores and home delivery can reduce the stress of dinner and help to keep your kitchen clean and clutter free. Links to great articles on how to unclutter your digital music collection. Want to listen to a little decluttering inspiration? Need a break from your regular Saturday morning routine? 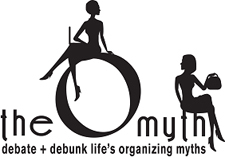 If you’re looking for a motivating diversion, check out Erin being interviewed yesterday on The O Myth, a weekly online radio show and podcast that explores the myths and misconceptions about being organized. On their show, Portland-based professional organizers Krista Colvin and Brandie Kajino debunk organizing stereotypes, and this week they specifically ask Erin if products are the solution to getting organized. You also might want to check out the upcoming O Myth episode scheduled for November 14, which will feature organizing superstar Peter Walsh. Note: The hard boiled egg method I discuss in the interview is from Alton Brown’s cookbook I’m Just Here for the Food. Thank you, too, to Krista and Brandie for being the hosts of such a fun and fabulous podcast on organizing. As I’m writing this, I’m waiting for a video conference call to start. It was scheduled to begin at 9:15 a.m., but it’s 10:30 a.m. and the call hasn’t happened. I have received four e-mail messages, however, saying that the people on the call are running late and they expect the call to begin in 10 minutes. I’ve been given no further explanation, and no efforts have been made to reschedule the call. Since I’m receiving e-mails, there must not be an emergency. Everyone is probably safe and okay. I bet the other people on the call believe that their time is more important than my time. It could also mean that the people on the call are completely disorganized and could really use my help, so I should be more compassionate. Wow, it’s now 10:45 and I’m still waiting. This call is an hour and a half late. I find this to be incredibly rude. If I don’t leave my office in the next two minutes I’m going to be late for my 11:00 appointment. Situations like this are unfortunately common practice in the business world. Disorganization flourishes in many corporate cultures. One person misses a deadline and that missed deadline is like a stone thrown into a pond where the ripples eventually reach everyone and everything in the water. In today’s economy, employees can’t afford to be disorganized. It’s no longer a matter of personality, it’s a matter of keeping one’s job and retaining or obtaining clients. If an employer is trying to decide whom to layoff and whom to keep, the most organized, profitable, and productive workers usually get to keep their jobs. Workers who consistently miss deadlines, run projects over budget, and upset clients and vendors with their inconsiderate behavior are the people who are let go. Additionally, current and potential clients won’t do business with your company if they don’t receive the product they expect on time and on budget. What additional suggestions would you add to this list? What are your favorite ways to stay organized at work? 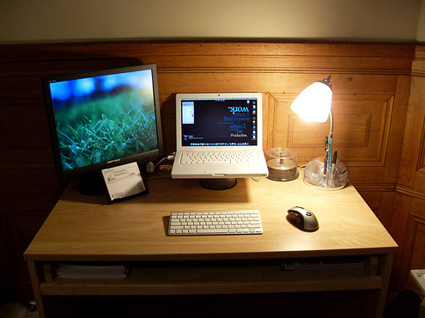 Keeping a desk in a dorm room in an uncluttered state is difficult work, even for the most organized of students. Reader Xeraphine keeps this Yale University space well maintained and efficient. 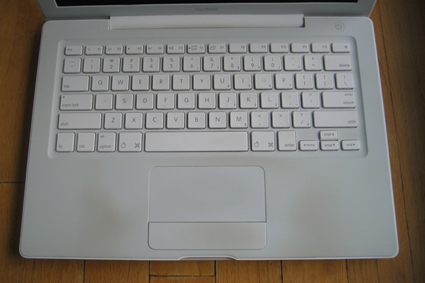 The wireless keyboard gets rid of cord clutter, the dual purpose task lighting and pen cup saves space, and the sliding shelf provides storage for notebooks and paper. To the right of the desk is a printer and stand with four drawers (I imagine Xeraphine’s books are kept in the drawers). Recently, Xeraphine added a DIY cardboard computer stand that hides cables and props up the computer. Thank you, Xeraphine, for sharing your inspiring dorm room office with us. I was just “hipped” to using clustering to organize the clothes in your closet. I really like the idea, however I am trying to imagine a neat looking closet that is organized in that fashion. And I also cant see an efficient (visually pleasing) way to see the distinctions between the clusters. I know people use those little round things that they have in department stores but I think there should be something better, maybe longer like a piece of material that can make a cleaner distinction. What are your thoughts on this method of closet organization and making it so that it is not visually cluttering? Clustering by type of clothing can easily make a visual distinction between groups of clothing in your closet and you probably won’t need a separator to indicate the start of a new section. This is how I organize my closet and, moving left to right, I have suit coats, slacks/pants, short sleeve tops, skirts, long sleeve tops, and dresses. The types of clothing are different enough that it is an abrupt change and no extra identification is necessary. I’ve also seen fabulously designed wardrobes built out of the Elfa system where different clusters are hung at different heights so that no group hangs immediately next to another group. If you have such a system, then simply rearrange the hanging rod heights to eliminate the side-by-side confusion. When people cluster items, however, they don’t always cluster slacks with slacks, short sleeve shirts with short sleeve shirts, and suit coats with suit coats. Some people cluster by color, season, type of situation where they would wear the clothing (office, client site, home, garden, exercise), or another clustering system that makes the most sense for his or her life. When this is the case, I can see a desire to use a more formal separation system on a single hanging rod. The following list contains just a few ideas I’ve seen successfully used in the past. I think the possibilities are endless, so be creative and go where your style leads you! Ribbons. Tie a piece of ribbon around the hanging rod and make it loose enough that it can move, but tight enough that it doesn’t slide around when you don’t want it to slide. Frilly types might want to make it into a bow, others might want to tie a knot and nothing more. Cedar blocks or lavender sachets. Using one of these items, you can ward off pests and separate your clothes. Clear suit bag. The person I saw who did this with her closet had a suit start every cluster of items. You wouldn’t have to use them for suits, though, and simply put the first item of each section in one of these. If any of our readers have more ideas, please share them in the comments!